Raw ingredient. Product obtained from the cold pressing of freshly wild crafted Ucuuba seeds. Natural product. No additives. 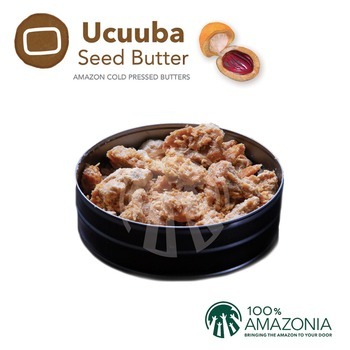 Ucuuba Butter has a high-melting point (53 °C) and saponification value (220 mg KOH / g oil), which exceeds the values of beef tallow (ranges from 43 to 45 °C and 200 mg KOH / g) and turns ucuuba butter into a unique raw material for replacing animal tallow in the production of fine soaps, as well as other fatty substances in the food and pharmaceutical industries that require a high melting point. Ucuuba seeds are rich in fat (60%–70%), and 70% of the fat is composed of trimyristin, a triglyceride of myristic acid which is an aromatic essential oil that is important to the cosmetic, pharmaceutical, and food industries. Currently, this essential oil is extracted from nutmeg, which has a concentration of about 80% of this triglyceride. At room temperature, protected from dust, moisture and light, in the original closed package. At room temperature, in clean vehicles, protected from dust, moisture and materials that can offer contamination risk. 100% Amazonia specializes supplying renewable non-timber forest products from the Amazon rainforest and helps turn them into unique ingredients for the food supplement, beverage and cosmetics industry. Located in the Amazon, 100% Amazonia was established to consolidate its local influence and production base. We have been active in processing and promoting Amazonian based products since 2004 but our experience in International trade, dates back to 1992. Additionally to the trading activities, 100% Amazonia provides strategic consulting services for product development, supply chain and market access. concentrated liquid extracts, purees, pulp fruit and Amazonian seed oils. 100% Amazonia has a unique strategic position among the agro-processing community, as well as the co-ops for fruit and seed pickers. Besides, our know-how and networking ensure authentic products with high added value to our customers. Our product line is carefully chosen to add nutrition and actives to our customer base. We do not work with carrier extracts, only with pure products. We are specialists in our field, not simply traders. Currently, 100% Amazonia exports to more than 45 countries in all continents. our credit scores are available at DNB.com through our DUNS registered number. Please visit and download our catalogs at: www.issuu.com/100amazonia.